When those pesky pounds won’t come off! So, you are eating primarily unprocessed or minimally processed foods. You are on a low-carbohydrate or low calorie diet, and you plateaued. You are not losing those last couple of pounds of fat anymore. To be honest for most people this does not really happen. Their nutrition leaves plenty to be improved upon. But if you are one of those driven people who knows the caloric amount and their macronutrients of every meal then re-feed days might be your solution. There are two ways of handling refeed days. You can have infrequent but big refeeds, or you can have more frequent but moderate refeed days. The goal is to never let your body settle into homeostasis, which is a fancy word for not letting your body settle into relatively stable and constant conditions. 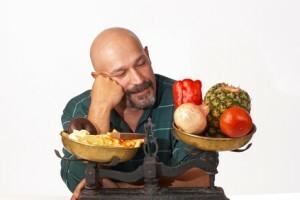 You will have one refeed day every one or two weeks while maintaining a low caloric or low carb diet on the other days. During that day you will eat a significantly higher amount of carbs and calories than on any other day. You need to be committed to a strict plan every 7 to 14 days. No deviations off the plan on regular days. Calorie restriction during refeed days = 3-3.5x your normal regular intake. Example: if you are normally taking in 1000 kcal then you would take in 3000-3500 kcal. Total intake should be about 1.5x of their low caloric, or low carb plan. If you are doing great with your nutrition, these two ways are a way to jumpstart your weight loss again. Please don’t forget. You need to be on point, no deviations. For that reason athletes in physique, bikini, or bodybuilding competitions are most of the time the only ones who are consistently using refeed days. Berardi, J. & Andrews, R. (2013) The Essentials of Sport and Exercise Nutrition. Precision Nutrition.